a falling pressure (low level alarm). 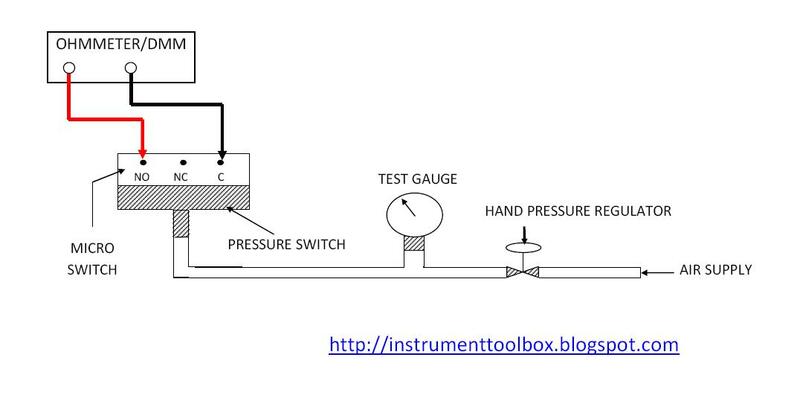 Most switches are designed to operate at a 'gauge' pressure setpoint i.e. relative to atmospheric pressure. Some applications require an 'absolute' pressure setpoint i.e. relative to absolute zero pressure, and an absolute pressure switch is required for these. Ideally the range of the switch should be chosen such that the setpoint is between 25% to 75% of this range. This is a setting that determines the amount of pressure change required to re-set the switch to its normal state after it has tripped. The dead-band or reset or switching differential is the difference in the rising and falling pressures at which the pressure switch operates. For a fixed differential output switch this is typically about 1% to 3% of the switch range. For an adjustable differential output switch it may be adjusted from about 5% to 12% of the switch range. The pressure switch is a ubiquitous device. It is practically everywhere in your plant. But how do you calibrate this simple device? The answer is here. Just follow the simple steps that I have outlined below. Also depressurize and isolate the pressure switch from the process. If opening the switch exposes voltages or energy that is not intrinsically safe, please follow the specified procedure for your plant. For example, if in an explosive environment, use a continuously monitoring gas detector to monitor for the presence of explosive gasses. 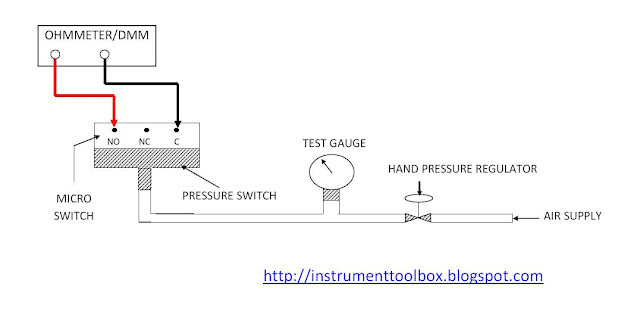 Connect the pressure switch to a pressure source e.g air supply via a hand pressure regulator and test gauge, as shown in the diagram above. Use an Ohmmeter or a Digital Multimeter (DMM) set to the continuity range to check and verify that the switch contacts are as indicated: NO (Normally open) and NC (Normally close). Connect the Ohmmeter or DMM between the normally open contacts(NO) and the common terminal (C) of the switch. The meter should read "open circuit". Adjust the hand pressure regulator to increase the pressure to the setpoint of the pressure switch until the contacts change over. The meter should now read "short circuit". Note the pressure reading and write it down. This pressure is the switch setpoint for a "rising" pressure. Increase the pressure to the switch to its maximum rating. Slowly reduce the pressure to the switch until the switch changes over from closed to normally open again. Note and write down this pressure reading. This pressure is the switch setting for a "falling" pressure. From the readings you have taken work out the pressure difference between the rising and falling pressure settings. This is called the "dead-band" of the switch. The dead-band calculated should be equal to or less than the manufacturers’ dead-band.